Book your spot for one of our coveted NBT in-person workshops! Choose your location, month or language and view upcoming workshops in your area. Was very informative and insightful. I would just recommend smaller groups or longer sessions for more focused attention to problem areas but overall very nice. Would like to suggest that they offer an English NBT Workshop for the English pupils in Paarl. Highly recommended!! Especially mathematics is a must! Was an enriching experience and I am pleased to have been taught so intricately. I would really not have been able to write the NBT tests without this workshop!!! I recommend it highly!! Wouldn’t have been able to write the NBTs if it wasn’t for this workshop. Very helpful! Dit het my ‘n goeie idee gegee van wat om te verwag en baie gerus gestel. Even though my son was full of flu, which would have made concentrating really tough, he still found great benefit from the course and said the way things were explained, "they seemed to click"...I'm sure it is going to help him. Pity he didn't attend something like this years ago! Thanks so much! My son was so impressed with the workshop and feels much better prepared for his test. The teacher was excellent. The entire experience was incredible! As I arrived there were printed notes, bonded notes, and a little pencil case of goods on my desk. The teacher, Roxy Lewis, was outstanding. I've given a look at the online part of the programme as well and it was just as impressive. Overall, it was a great experience and I would definitely recommend. I received excellent feedback from my daughter. Thanks for this valuable workshop at the Southdowns College. It was really helpful. It gets you to think in a new mindset. Michaela found the workshop very useful and necessary for her preparation to write the nbt’s. We are hopeful that she will do well in her up and coming Nbt tests next month. Excellent preparation for the NBT exams! Presenter Dilla is well prepared with excellent skills. Advantage Learn really helped me to approach mathematical questions differently in a more time effective way and tricks to answer the questions. Incredible! All work is relevant and helped a lot, excellent service and was worth the time! I would highly recommend it and I already have to the grade 12 year of 2019! Excellent preparation for the NBT course. Gave really good insight into ways to approach the types of questions likely to appear in the NBT test. This Trails course prepared me like no other math course! Not only was I fully prepared in all major aspects of both my math examinations but we completed 30 hours of math - I would never have achieved that by myself! I was not stressed when checking all major components had been learnt therefore this lent me more time to revise rather than stressing the day before! Thank you Advantage Learn! It was very informative. Trish Pike is brillant and I learnt alot from her. Brilliant preparation course for nbt. Really put things into focus for me. Definitely recommend all matriculants to attend. it was extremely helpful...I didn't even realize the time that passed. Highly recommended to students looking to write nbts or even normal mathematics. Dane was blown away by this weekends workshop! Was fantastic! Was one of the best maths lessons I have ever had. This was a brilliant course that really helped me to prepare well for NBTs. The workshops were extremely helpful in assuring that I was fully prepared for the NBTs by providing new ways to tackle problems that I would not have ordinarily thought of. 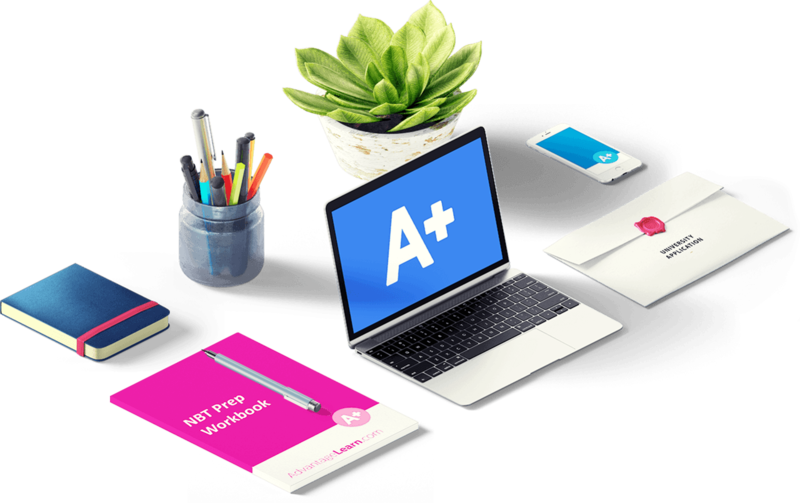 The workshops also gave many practice papers with their solutions so that I could better understand the sort of questions and style of testing that the NBTs use. Really Really worth it! I would defs recommend it to anyone in matric - struggling or not! This course has given me far more insight into what to expect for the NBT than I had ever thought! The workshop has provided me with a new look at that maths asked in the NBT, but has also helped greatly with my normal maths too. i would have been caught off guard by the NBT's if it weren't for this workshop. We were not only told what to expect and how it would work, but also taught the tips and tricks needed to do well in the tests. Excellent revision and teaching methods allowing me to go into the test with much less fear. definitely recommended. The workshop helped tremendously with the sections that I struggled in. I benefited from the different ways in which I could look at questions to obtain a rapid answer in an effective way. I liked that the workshop pin pointed the areas that I need improvement and how I can fix these areas. I appreciate the advice and tips that was given to us during the workshop. The cause was informative, and I've learnt a lot. The tutor is so knowledgeable , I picked up a lot of formulas from her which I am now using in my day to day lessons. really helpful course and very beneficial! This NBT workshop was extremely helpful and really calmed me down ahead of my NBT. The lessons were very informative and easy to understand aswell as it prepared me more than enough to write my NBT. Big thank you to advantagelearn and the educator for it. I found the NBT Workshop useful, students should actually sign up for the course as useful tips were given by Trish. An amazing workshop with thorough revision and tips that are definitely worth while ! Would definitely recommend it! I found it really helpful... do not know what I would have done without it! The course was great! One thing is that you need to stay focused as it is very lengthly, and you interchange between sections quickly, which you may be rusty on - but the revision I thought was essential in order to understand and to be prepared for what's coming in the NBT paper. Thank you! I never realised there were so many ways to complete sums and now I feel really prepared. Absolutely helpful! Heather opens your eyes to quick memorable tricks that can help you tackle any sum or problem in your path without a calculator to help you. The Advantage learn in-person course and the online course have helped me greatly with my NBTs! I appreciate all the lessons online as well as the mock exams because these together really did prove to be useful, especially for the MAT. My daughter was so stimulated and impressed at how much she learnt. She loved the passion projected from the trainer. The NBT course really gave me a deeper understanding to maths which will greatly assist me in my NBT exam. The workshop was absolutely amazing I learnt so much ! I definitetly feel more prepared for the NBT's and it has given me insight into maths core questions as well , thank you ! Advantage learn is the best NBT Training. This really opens my mind to thin beyond maths. Course was helpful, interesting and highly recommended. My son reported that the work was worthwhile as it was also prep for grade 12 exams. Extremely helpful and teaching was exemplary and easy to understand. Only suggestion would be to possibly cover more content. However, overall an excellent experience. The NBT workshop is a great preparation course. It is a fast-paced, high energy environment that promotes learning and growth. Excellent Workshop. Improvement: Tackle more difficult questions with students. Extend the hours of mathematics workshop. Awesome workshop. Lots of insight and guidance. I really enjoyed the interactive atmosphere, and allowing us to challenge ourselves by attempting the questions first and being taught amazing tricks and short cuts. I really could not have asked for better preparation! My daughter was disappointed in the course as she felt it was purely maths revision and she could have achieved the same by working through past papers on her own. Thus she decided not to return for the second day. She felt it would probably benefit people who struggle with Maths more. Very productive, helpful. Brilliant teaching! My daughter attended She has only good things to say ! Thank you! I believe our children (twins) found it very helpful!With Thanks! I am encouraging them to download the pratoce session online in order to start with it. My son attended the course. Felt it was very informative. I found the course beneficial and extremely helpful in preparing for NBT's. The style of teaching was brilliant, as I always felt challenged. I gained lots of insight and understanding into the way that I will be examined, and how to answer those questions. Very passionate instructors that know the subject matter well and are very patient. So helpful, there is always someone online willing to help with any hassles and the questions and courses are fantastic! EXCELLENT OPPORTUNITY TO PREPARE FOR NBTS!Learnt a few extra time saving tips for my general academic work as well.This workshop is a must! It is really worth the while to go to the workshops. It gives you a good backround of what to expect and you get valueble skills. Hi, De Wet said he learnt a lot, and was happy he was there. Roxy was a great teacher and helped me a lot, I think I would have failed if I didn’t go to this course!!!! I really enjoyed how the notes were presented - fun, interactive and easy to recall. The skills are unimaginable and quite helpful in trying to understand the problems. I am so glad I did this course! The methods shown to us will not only help me at Nbt's but also in class.